Dreamy pastels and solarized neon hues accentuate the Akademia's collection for a trendy spring and summer season. As always in the Akademia hairstyles collections there are two types of looks to match the wants and needs of many different women. 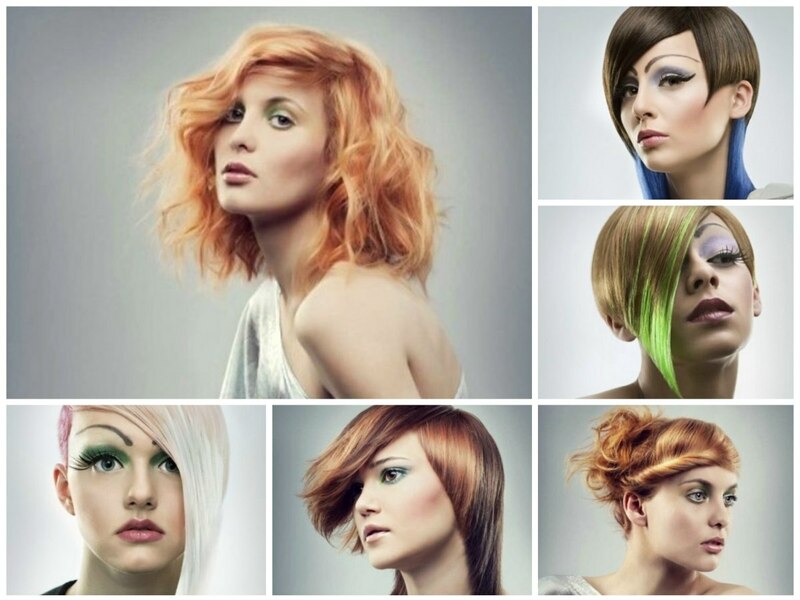 The first three styles follow the rules of geometry and work with extended lengths juxtaposed to short sections. Sleek asymmetry is styled very close to the head with every single hair fixed in its perfect spot. The organic and pointy lines remind of modern design with a minimalist touch à la Philippe Starck or the glass artist Dale Chihuly. In addition a hint of commedia dell art and surrealism cannot be denied. The second part of the collection features feminine, flowing shapes in gleaming copper tones. 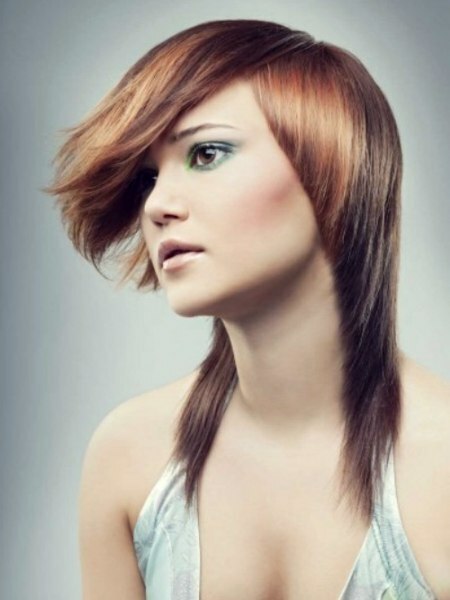 Three colors set the tone for this slinky, sleek asymmetrical hairstyle. A gentle fuchsia graces the millimeter short sides and continues in a thin strand along the side of the asymmetrical, triangular fringe that reaches about 1 inch below the chin. A beige blonde brings some warmth and a natural touch to the top section before it transitions into a pearly white tip. 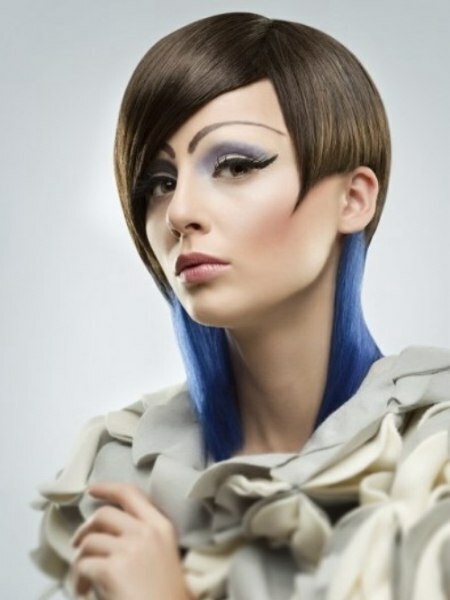 To achieve this cool shape the longer top hair was all styled towards the front and fixed with a good, flexible product. 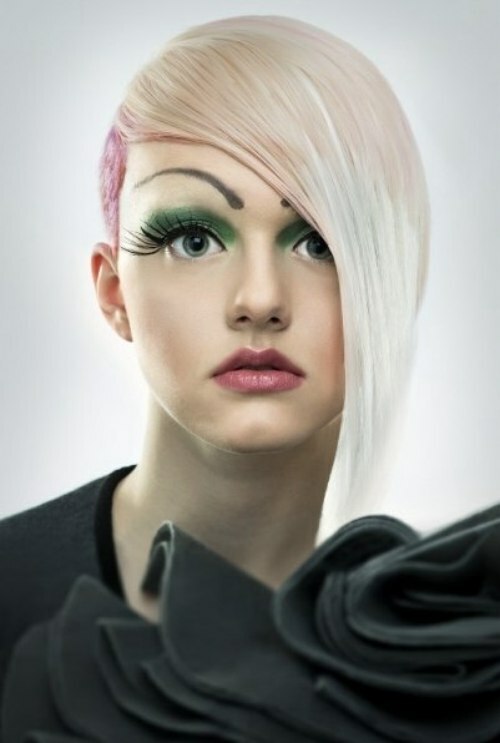 The adventurous combination of naturally hued dark blonde shades with a neon-as-can-be green hair color flash at the tip of the long asymmetrical fringe is highly unique and refreshing it its sizzling extravagance. Around the head it is the curved roundness, cut to mid-ear that brings that balances only to be disrupted by the triangular, tapered fringe that is styled in a distinct line across the face and reaches below the chin. Geometry extraordinaire comes together with an unusual but highly energetic color combination of a natural, deep brown and an electric blue, as we know it from neon signs that brighten up the urban nights. 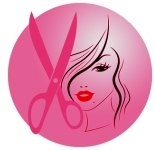 Cut with perfection in mind the shape is rounded and clings close to the shape of the head. 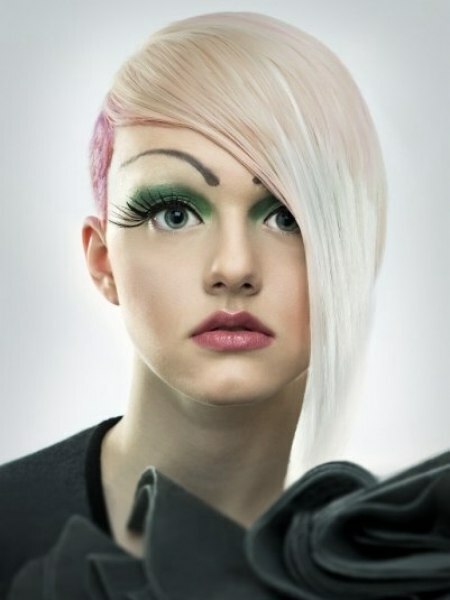 An asymmetrical fringe connects with the long side while the short side defines itself with the cheekbone-pronouncing point. 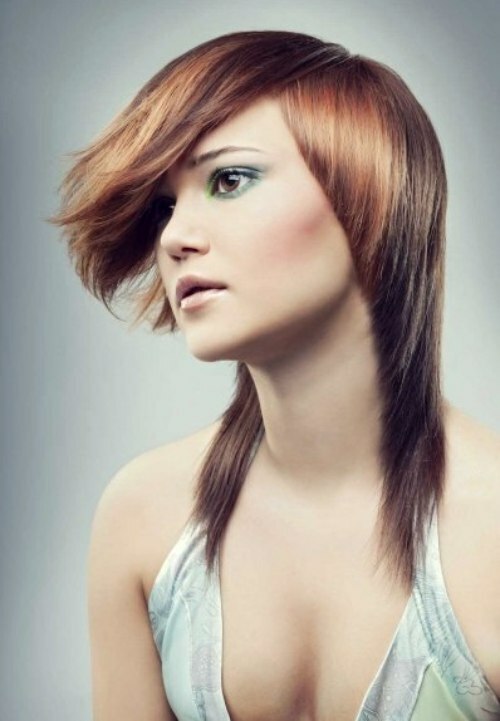 Copper can come in a wide range of hues, here the brightest and freshest nuance of brand new, untarnished metal was chosen to illuminate the medium long, generously tousled hairstyle. The hair was cut to the same length all around, except for some shorter tresses in front. The styling although performed in rough sections results in a light and delicate look. 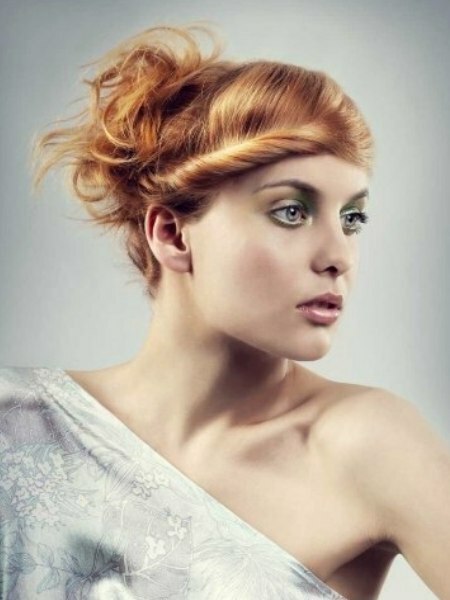 A great way to hide a long fringe for an open look that is not disrupted by free flying hair is to roll the hair beginning in the front and then incorporating the side hair until the roll reaches the ear behind where it is invisibly pinned under a pouf of copper and nutmeg tousles. The intricate color combination is especially stunning with three tones from brown to blonde with plenty of gold and copper shimmer. A steep tapered line from the upper forehead all the way to the tips below the shoulders is topped by a thick, rounded section that forms the long fringe and starts in the back of the crown. The trendy tension of the different lengths and textures is complimented by the smooth combination of earthy colors - a shimmering chestnut, gold and a muted brown that give the impression of the grain in very precious wood.